Preparing your home for the holidays might be more fun, but preparing it for colder weather is not only more important, but will save you money. 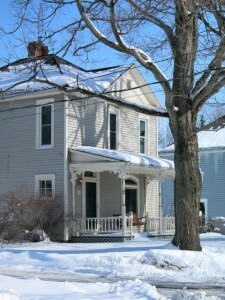 The U.S. Department of Energy’s Energy Saver website has these tips for protecting your home from the ravages of Old Man Winter. 1) Check for air leaks. You pay good money to heat your home; you want to keep the heat in and the cold out. Feel around doors and windows and make note of any breezes. Weather stripping is perfect for doors and windows that need to open. Caulk around door and window frames. Indoor window insulation kits are inexpensive and easily hidden behind curtains. 2) Pay attention to your furnace. It’s not too late to clean it, and change the filter on a regular basis. Buy several when they’re on sale and you won’t run out. 3) Seal and insulate the ducts. A home with central heating can lose up to 20% of the air moving through it. According to the Department of Energy, properly sealed and insulated ducts can reduce your annual energy bills by at least $120. 4) Flip the switch on your ceiling fan. This is probably the easiest part of your winter prep plan. Most of us have heard that fans can move warm air back down into a room (remember, heat rises), but it can be hard to tell which way the blades should be going. Turn on the fan and stand underneath. In winter, you want the blades to go clockwise. If they aren’t, use a stepladder to climb up and flip the switch. Set a reminder on your phone to flip the switch back when the temperatures rise. 5) You dress in layers and so should your windows. Storm windows reduce heat loss by up to 20%. Curtains help block cold even more, although you may want to leave them open during the day if the window receives direct sunlight. 6) If you’re worried about frozen pipes, This Old House’s website has some great hints for insulating them. Use foam rubber pipe insulation around exposed pipes. Miter-cut the foam at the corners with scissors for an air tight fit. If pipes do freeze despite your best efforts, open a faucet and use a heat gun or hair dryer to defrost the pipes. Never use a propane torch or other open flame! If you find yourself dealing with the aftermath of frozen pipes or a fireplace blowout, call the pros at ServiceMaster DAK. Their professionals are on call 24 hours a day, seven days a week to quickly respond to commercial and residential disasters. They’ve been helping to minimize damage from frozen pipes and other disasters in Northbrook, Wilmette, Glenview, Highland Park, Lake Forest, Winnetka, and Buffalo Grove for 40 years.